Tomato Pesto Gratin may seem like a summer dish if ever there was one, but the beauty of it is that it brings the familiar flavors of your farmer’s market bounty into your kitchen in the dead of winter. Last weekend, I was toiling around the kitchen after a week-long bout of bronchitis, anxious to cook and eat all the vegetables I could find. Having just spent seven full days with a stuffed nose and congested chest, I wanted bold flavors I could actually taste and enjoy. Side note: I’ll never take my taste buds for granted again. Digging through the crisper, I thought I’d make some omelettes, maybe with some red peppers and spinach, but therein, I spied five plum tomatoes that I had managed to forget about during our brief plague. I know, I know, tomatoes don’t belong in the refrigerator, but when illness set in, there was no common sense exercised about what belonged where, for how long, or why. We’re lucky the cats were fed and, occasionally, the dishwasher ran. Quickly, the idea for bruschetta came to mind, but with temperatures dipping well into the negative numbers, a cold salad alongside some eggs and toast, wasn’t all that appealing. But baked tomatoes were my quick next thought, and a damn good one at that. We had them again this weekend and I’m taking the leftovers for work on Monday alongside a salad and a hunk of crusty sourdough that we got this weekend at a new bakery in our neighborhood. I’m already looking forward to it! Because I wanted these to be sweet, tender, and concentrated in tomato flavor, I seeded the tomatoes and then roasted them for 10 minutes without any of the filling. A little known fact about me is that I actually really dislike the taste of raw tomatoes, unless they’re in something like bruschetta or salsa where they’re broken down a bit by some kind of acid – lemon or lime, vinegar – and then mixed up with a ton of flavors I love – onion, cilantro or basil, lots and lots of garlic…yum! Once the tomatoes are halfway to jammy (that’s a technical phrase), I took them out of the oven and filled them with a tablespoon of homemade pesto I had in my freezer from last summer and then topped each little mound with a small amount of shredded mozzarella and panko bread crumbs. They cook for another 20 minutes or until the tops become brown and crisp and the cheese and oil from the pesto are both bubbling away. 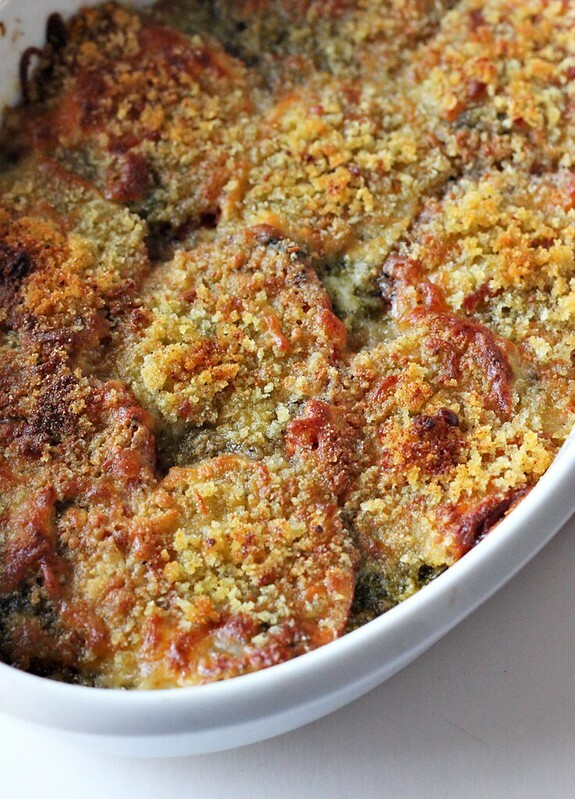 These are beyond delicious and such an easy any meal, any day of the week, kind of recipe. We had them with eggs – and may or may not have dipped our sourdough toast in all of the oil and juice – but these would be good along side a steak, grilled chicken, fish, as much as they’re a meal all their own with a hearty salad. 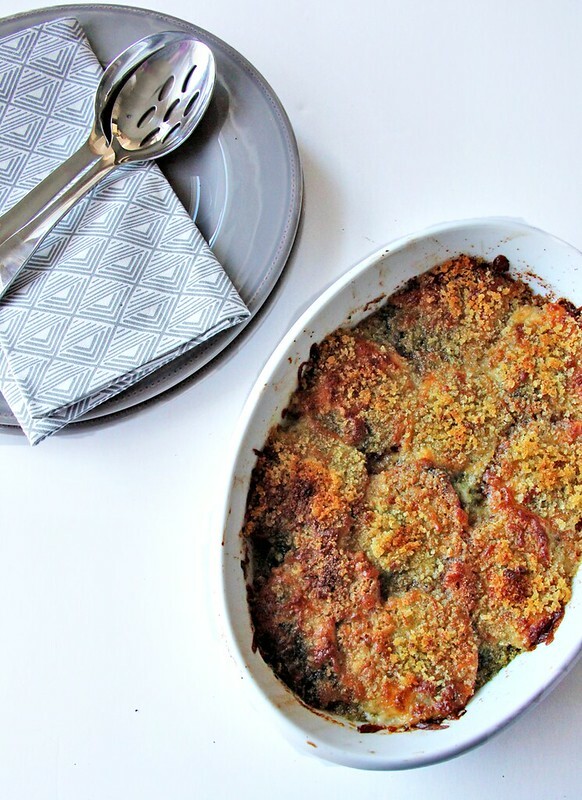 Tomato Pesto Gratin is my favorite side dish of the New Year so far and I fully expect to fall back on it time and time again between now and actual summer. Between now and July, I plan to eat my fill and then some! Preheat your oven to 375°F. Slice tomatoes in half and scoop out seeds and center flesh. You can toss this or use it in a soup, salsa, or as part of a light pasta sauce at another time. In a bowl, add the tomatoes and then douse with two tablespoons of olive oil. Toss to coat and then arrange in a baking dish that is about an inch taller than the height of the tomatoes. 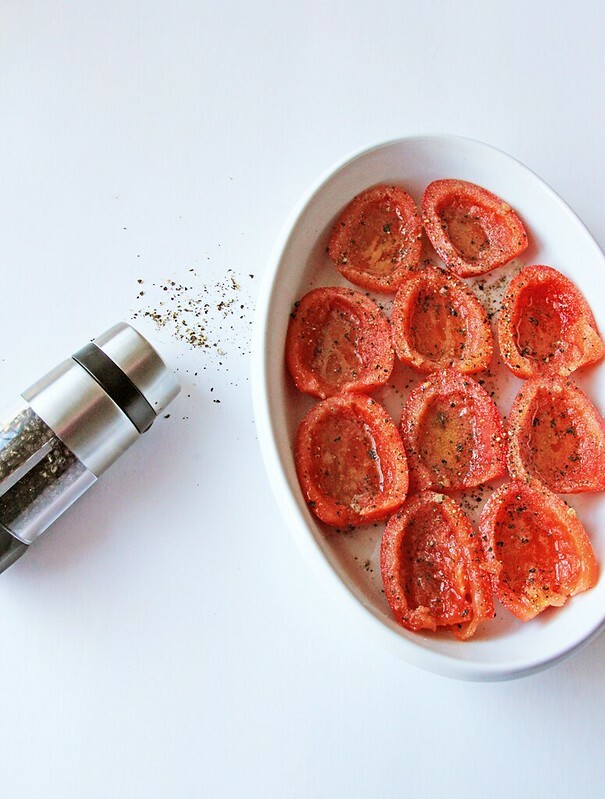 Sprinkle a teaspoon of the garlic powder over the tomatoes and add salt and pepper. Bake for 10-15 minutes. Remove the tomatoes from the oven and raise the temperature to 400°F. 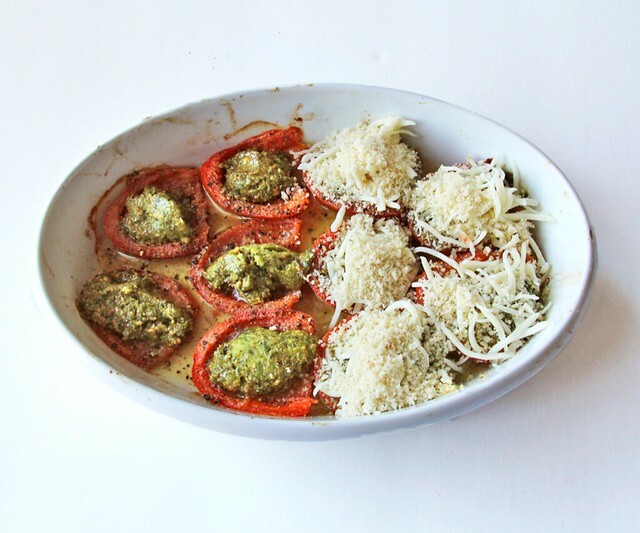 Fill each tomato half with a tablespoon of the pesto and top with approximately the same amount of shredded mozzarella cheese. 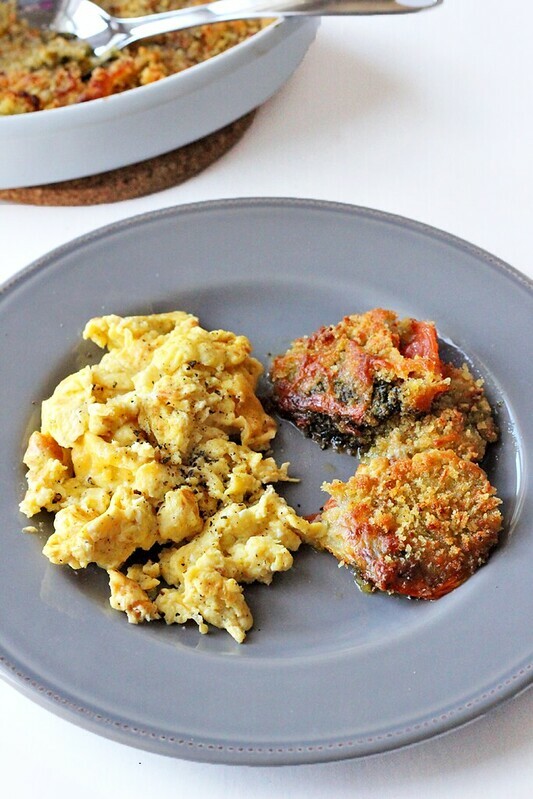 Spoon 2 tablespoons of panko bread crumbs over each tomato half and top all of the pieces with the remaining 1/2 teaspoon of garlic powder. Return to the oven and bake for another 20 minutes or until the panko is lightly browned and crisp. ThE first thing that came to mind was A Caprese Salad brfor looking at the FB attachment. YUMMO!